This form is a subordination, attornment and non-disturbance agreement (commonly referred to as SNDA) drafted for US Bank. The bank is the lender that made the real estate loan on the property containing the tenant's premises. 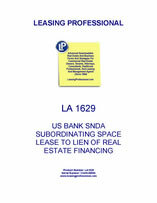 THIS AGREEMENT is made and entered into as of _______, 20__ by, between and among U.S. BANK NATIONAL ASSOCIATION, a national banking association (together with any other party referred to in paragraph 5 hereof, the “Lender”), COMMERCIAL TENANT, a ___________ corporation (“Tenant”), and COMMERCIAL LANDLORD LLC, a ___________ limited liability company (“Landlord”). A. Lender is or will be the Beneficiary under a Deed of Trust (the “Mortgage”), which Mortgage does or will constitute a lien or encumbrance on that certain real property more particularly described in the attached Exhibit “A” (the “Property”). B. Tenant is the holder of a leasehold estate for approximately _________ rentable square feet in the building located on the Property (the “Leased Premises”) pursuant to the terms of that certain Office Lease dated ______, 20_ , and executed by Tenant and Landlord (as amended to the date hereof, the “Lease”). C. Tenant, Landlord and Lender desire to confirm their understanding with respect to the Lease and the Mortgage. 1. So long as no default exists nor any event has continued to exist for such period of time (after notice, if any, required by the Lease and after the expiration of any cure period provided for in the Lease) as would entitle the Landlord under the Lease to terminate the Lease or would cause, without any further action of Landlord the termination of the Lease or would entitle Landlord to dispossess Tenant thereunder, the Lease shall not be terminated nor shall Tenant’s use, possession, and enjoyment of the Leased Premises be interfered with, nor shall the leasehold estate granted by the Lease be affected in any foreclosure or in any action or proceeding instituted under or in connection with the Mortgage or by reason of any deed in lieu of foreclosure of the Mortgage. In addition, Tenant shall not be named or joined in any foreclosure, trustee’s sale or other proceeding to enforce the Mortgage unless the joinder is required in order to perfect such foreclosure, trustee’s sale, or other proceeding. 2. If the interests of Landlord shall be transferred to and/or owned by Lender by, reason of judicial foreclosure, power-of-sale foreclosure or other proceedings brought by it, or by any other manner, including but not limited to Lender’s exercise of its rights under any assignment(s) of leases and rents or a deed in lieu of foreclosure, and Lender succeeds to the interest of the Landlord under the Lease, Tenant shall be bound to Lender under all of the terms, covenants and conditions of the Lease for the balance of the remaining term thereof and any extension thereof duly exercised by Tenant, with the same force and effect as if Lender were the Landlord under the Lease, and Tenant does hereby attorn to Lender as its lessor, said attornment to be effective and self-operative without the execution of any further instruments immediately upon Lender’s succeeding to the interest of the Landlord under the Lease; provided, however, that Tenant shall be obligated to pay rent to Lender, rather than Landlord, only when Tenant receives written notice to that effect from Lender. The respective rights and obligations of Tenant and Lender upon such attornment, to the extent of the then remaining balance of the term of the Lease and any such extension, shall be and are the same as now set forth therein, it being the intention of the parties hereto for this purpose to incorporate the Lease in this Agreement by reference with the same force and effect as if set forth at length herein. (d) Bound by any amendment or modification of the Lease made after the date hereof without its written consent. Neither the original Lender named in this Agreement nor any other party who, from time to time, shall be included in the definition of Lender hereunder shall have any liability or responsibility under or pursuant to the terms of this Agreement with respect to any matters arising during any period of time falling after it ceases to own a fee interest in the property described on Exhibit “A”. 4. Subject to the terms of this Agreement (including but not limited to those in Section 2 hereof), Tenant hereby subordinates the Lease, in each and every respect, to the Mortgage and to any and all renewals, modifications, extensions, substitutions, replacements, and/or consolidations of the Mortgage. Nothing herein contained shall be deemed or construed as limiting or restricting the enforcement by Lender of any of the terms, covenants, provisions or remedies of the Mortgage.